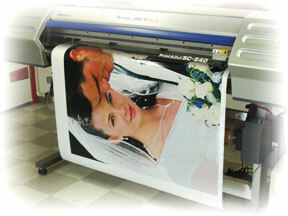 Banners are a great and economic means of advertising your promotion, identity or message. By the square foot, banners are one of the least expensive forms of advertising. Banners are also easy to roll up and transport. This makes them great for identifying your business or product at trade shows and fairs. Retractable and other stands are available for displaying your banners. Banners come in weights ranging from 10 oz. to 17 oz. vinyl, our standard weights are 13 and 17 oz. vinyl. Black-out banner material is available for two-sided signs where readability problems due to back lighting are an issue. Reinforced corners for large banners or banners that are suspended between posts or stakes. Removable vinyl lettering for changing event dates and places. Added velcro panels for changing information. Sleeves for poles or rope. Standard Banner widths include 24", 30", 36", 48", 52", 60" & 72", although custom sizes are also available. Banners can be sewn to any length. Pricing is based on size, single or multiple colors and added extras or design upgrades. For a price quote or for more information on banners please contact us. For tips on hanging banners see our reference section. For examples of our banners, please visit our Product Gallery. To purchase a full color banner online and have it shipped to you, see the online store window below. Please note that currently our online store does not calculate quantity discounts for 2 or more of the same banner. To receive quantity discount information please contact us. Buy now and receive a free automatic upgrade to 17oz. reinforced vinyl.